Taking afternoon tea at the Peninsula Hotel Hong Kong is one of the few traditions left in the city from its colonial period. Once the hottest ticket in town for governors, generals and visiting royalty, the Peninsula Hotel has been serving up tea since 1928. And, while the British may have left, the tradition remains undisturbed. While you can take tea at any of the top five afternoon tea spots in Hong Kong, the adherence to tradition and attention to detail at the Peninsula means it still stands above its rivals. It's also all about the setting. The classic colonial curves of the Peninsula Hotel include marble floors, gilded columns, and expensive paintings. It's an impeccably dressed backdrop to taking tea. Similarly, while Hong Kong is flooded with five-star hotels and their Michelin starred restaurants, the Peninsula is still setting the example to follow in luxury. Tea at the Peninsula is straight out of Alice in Wonderland. The tea itself is Earl Grey, naturally, although you can also choose less fragrant breakfast tea. This comes served with a classical selection of finger sandwiches and freshly baked scones on a tiered silver platter. The presentation will have you reaching for your camera. On the sandwiches, you'll get cheese, cucumber and other straightforward classics served on crustless white bread. But it's the scenes that are the real stars of the show. Stuffed with raisins they are served with jam and Devonshire clotted cream—the latter is a thick cream traditionally served in the UK but rarely found on Hong Kong tea menus. It's also an absolute treat. All in all, it's the same tea set you'd find at a cricket match in the English countryside. Afternoon tea is a fussy affair, so definitely plan to look polished and classy. Do dress up and expect butlers and waiters to treat you like true royalty. Besides bow-tied waiters swooping around the room, you'll also find a string quartet playing the greatest hits of Handel and Schoenberg. The Lobby, where the tea is served, still enforces a dress code, although it has been greatly watered down. You won't get in if you are wearing flip flops, and men need a long sleeve shirt. 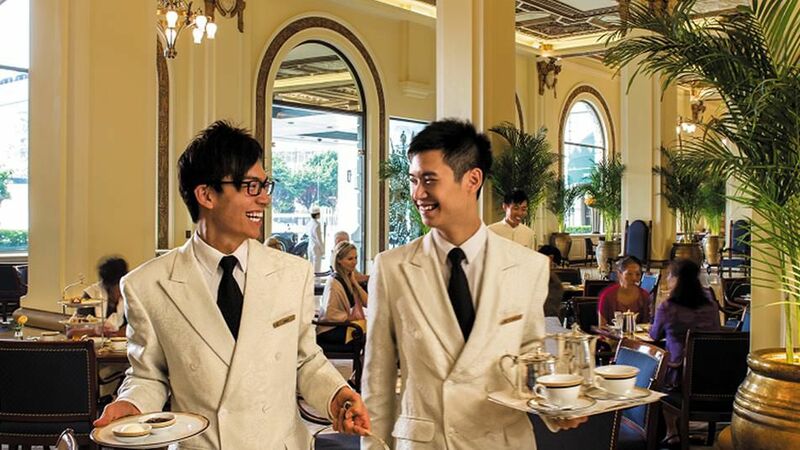 Afternoon tea is offered at the Peninsula every day from 2 p.m. to 6 p.m. The Lobby does not accept reservations, and at weekends you may need to queue before getting a seat. It also doesn't come cheap. You'll pay HK $358 for one person and HK $628 for two.